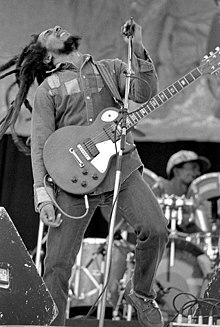 Bob Marley performing in concert, circa 1980. ↑ Jon Masouri. Wailing Blues - The Story of Bob Marley's Wailers. Music Sales Group. pp. 242–. ISBN 978-0-85712-035-9. Retrieved 7 September 2013.